Synopsis from Goodreads Circa 1990. There are books that will cry hoarse and demand you to pick them up , and there are the unassuming ones that will quietly work their magic on you . Before you reach the last page of the book , it would have successfully cast a spell on you. The Other Side of The Table belongs to the second variety. I have always loved reading epistolary books ; this books hasn't disappointed me as well .Letters fly back and forth Abhi, who is a neurosurgeon based in London and Uma, a feisty girl stepping into the world of medicine in Kolkatta. What do they write about ? anything and everything that goes on in their life. 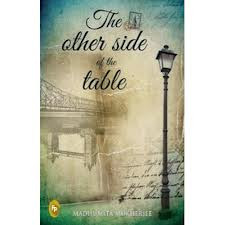 Madhumita has done a great job in capturing the essence of both the characters through the letters they pen. Uma who appears rather immature and impetuous at the beginning mellows into a resilient woman as things get tough at work and with her domestic front. Abhi , who initially comes across as a level-headed intelligent chap turns pessimistic when he gets ill.Lovers lost , disappointments faced, new achievements conquered - the letters tell them all. The language is lovely and the editing taut. Despite being an erudite piece of fiction, the book is amazingly easy to read and not pretentious one bit.The pace is just right and will keep you hooked till the end. I read this book in not more than two stretches , and wanted to sorely get back to the book when I couldn't read it in-between . Which is why I think that this is a rather good book , as not many books make you want to drop everything else you are doing and get back to them pronto. Overall, a thought provoking book that will weave its magic on you. Many thanks to Arcopol from Fingerprint for sending this copy across. Sounds like an interesting one!! Bookmarking it for future!!! Extremely well written book.. I am surprised you haven't reviewed it yet.